Suizi Lin is dedicated to protecting the rights of individuals. This dedication has led her to specialize in wrongful death and personal injury litigation. She has represented numerous workers and consumers against corporations and insurance companies in the fields of personal injury, wrongful death, medical malpractice and sexual abuse matters and has represented elderly and dependent adults in elder abuse and neglect cases. Suizi is a graduate of the University of California, Berkeley and Loyola Law School Los Angeles. During law school Suizi developed an understanding of what occurs in judicial chambers by being an extern in a state court criminal division at in the Chambers of Judge William Dettmering; an extern in an administrative court of the Equal Employment Opportunity Commission with Honorable Diane Arkow-Gross; and an extern in the 9th Circuit Court of Appeals in the Judicial Chambers of Stephen Reinhardt. To broaden her horizons, Suizi assisted detainees in the Mira Loma Detention Center with their asylum and deportation appeals as an extern with the Southern California ACLU. Suizi learned the administrative side of claims by governmental employees against their employers as an extern in the California Attorney General Office. After law school, Suizi returned to her home town of Union City where she graduated from James Logan High School. She began working as an associate at the venerable firm of Furtado, Jaspovice and Simons in Hayward, CA with its long history of representing workers since 1951. Suizi's first cases at Furtado, Jaspovice and Simons were in Clergy III, the sexual abuse cases in the Bay Area. Mr. Rick Simons was the plaintiff liaison in the Clergy III cases, handling over 150 cases and leading all plaintiff attorneys in procedural issues of the highly complex cases. Through this experience Suizi discovered the personal satisfaction that comes with successful advocacy for the innocent-party in personal injury cases. Since then, Suizi has successful advocated for those injured in automobile collisions; injuries on buses; sexual abuse cases; swimming pool disrepair and neglect; slips, trips and falls; nursing home neglect and medical malpractice. With the guidance of Martin L. Jaspovice and Rick Simons, Suizi has learned the ins and outs of civil litigation. Suizi was also the managing partner of Lin Santo, LLP, a 4 lawyer partnership consisting of Martin L. Jaspovice, Rick Simons, Suizi Lin and Rica Cruz-Santo. Suizi successfully managed a 6 attorney law practice prior to opening her own practice. Suizi is actively involved in the following professional organizations: Alameda-Contra Costa County Trial Lawyers Association; Asian American Bar Association; Consumer Attorneys of California; and San Francisco Trial Lawyers Association. 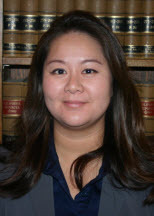 Suizi volunteers her time with the Alameda County VLSC and with the Asian American Bar Associations APILO legal clinic. Suizi has been named Super Lawyer's Northern California Rising Star in 2010, 2011, 2012, 2013, 2014 and 2015. She was named Top 40 Under 40 by the National Trial Lawyers in 2012, 2013 and 2014. In her spare time, Suizi hikes, bikes, makes 3D pop up cards, watches Japanese Anime and enjoys time with her family.